This work provides in-depth information and analysis of Confederate medicine in the Army of Tennessee using primary sources and individual patient records in a form not previously available. There are 213 diagnosis, approximately 18,000 patients from thirteen states, and more than 860 numbered and named units. 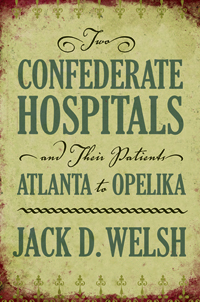 The two hospitals under discussion originated in Atlanta in 1862 and moved to Vineville, Georgia, in 1864 before Atlanta fell. One later moved to Cornith to support General John B. Hood. They both finally closed in Opelika, Alabama in 1865. Effects of changing numbers of admissions, three major relocations, limited bed space, at times too few surgeons, and the disintegrating Southern railroad system are detailed. Since the original data are derived from various primary sources with different methods of recording and some incomplete records, the data and the methods of collecting and collating it are described. Use of individual patient records allowed analysis of Confederate Army of Tennessee disease patterns and patient dispositions. Patient care was also impacted by frequent changes in rules, regulations, and orders in response to military events. Prognostications, the ability to predict outcome of diseases and wounds, were required by the surgeons to carry out the various orders determining patient disposition. This aspect of Civil War medicine has not been previously discussed. Problems with comparing various published Civil War medical data with the present material are examined. Included in the book is a CD-ROM of the complete patient listings of more than 18,000 patients.